It was always my dream to run my own business, which I finally did full time just before I turned thirty. Ever since, I’ve always loved reading stories about entrepreneurs. There’s a certain comfort that comes from reading about others in your own field, or one you’re moving into. That’s one of the reasons I want to gather interesting stories about what life is like as a home stager. I have many of my own quirky client stories and I know many of my readers do too. I’d love to hear your story and it could potentially end up in my new book, which will be published in 2010 and featured on Amazon and elsewhere. “Life as a Home Stager: An Inside Look at What It’s Really Like in the Home Staging Business” is filled with heartwarming, funny and sometimes shocking stories about what it’s really like being a home stager. Inspiring and informative, this book will give you an honest look at what it’s like to work in this exciting and creative industry. a client who was going through a particularly difficult or life-changing event when you staged their home and how you helped them through the process. a tricky staging project and how you rose to the challenge. a client’s strange choice of decor and how you convinced them to change it. a funny mishap or a silly mistake you made while staging a client’s home. 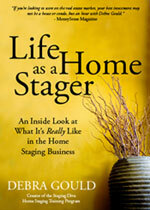 how your staging career has affected other aspects of your life. “I worked in criminal law before becoming a professional home stager. I ran my own law office with my husband. But after a number of years, I was hitting the snooze button more and more and when I finally got on the road to work, I had to stop 2 or 3 times to vomit on the side of the road. I took one year off to get well again (I had lost over 50 pounds, couldn’t hardly eat or sleep) and then started looking at what I wanted to do for the rest of my life. I’ve always been passionate about decorating yet I still had the mindset of wanting to really help people. I remembered my grandmother telling me when I was a small child to ‘choose a career that you have passion for, that way you’ll never have to work a single day in your life!’ She was right. To be part of this exciting new book, you don’t have to be a professional writer. Anything you submit will be edited, you just have to give us the interesting story to start with. If you’re selected, you’ll get a free copy of the book once it’s printed PLUS the bragging rights of saying you’re featured in a published book, adding to your own credibility as a home stager. > Learn how to be part of this new book and get your copy free!